High style and elaborate filigree work combine in this genuinely gorgeous garnet ring from Apples of Gold. 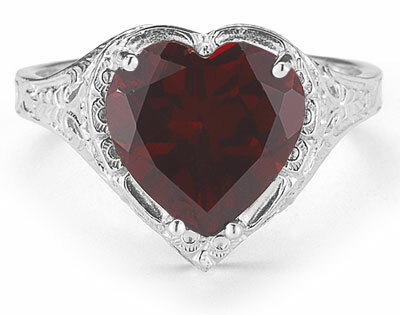 The garnet stone features a heart-shape cut for the best that love can bring. The rich red color of the stone is given a wonderful place of display with an elegant silver setting and band. Four prongs keep the heart stone secure, while the silver setting weaves an antique-style engraving throughout. The motif features beautifully etched flowers and swirling shapes to make this one refined gemstone ring. We guarantee our Vintage Filigree Garnet Heart Ring in Sterling Silver to be high quality, authentic jewelry, as described above.